to give you an idea of just how big this new work will be. Tonight's image is the very, very first stage of going big. as I go ahead with it. work for a few months. the beginning of the squirrels' art project. a week and a half ago to decorate our front porch. Thanksgiving Day, and they destroyed our pumpkins. I am so excited about your next painting(s). You'll have so much fun you'll want to roll around on them while wet. You know, you could make up a scary story to tell the kids, cuz, right now, that squirrel is very spooky to me. We don't have 'em that big in the desert. I thought it was a chihuahua! Have a great weekend in your studio. I'll be sending you art vibes of encouragement. Oh wow, that is soooo exciting, Barbara! I can't wait to see the wonderful picture you will create on those canvasas. Hubert has been trying to get me to paint a big food still life for YEARS but somehow I never got round to it. 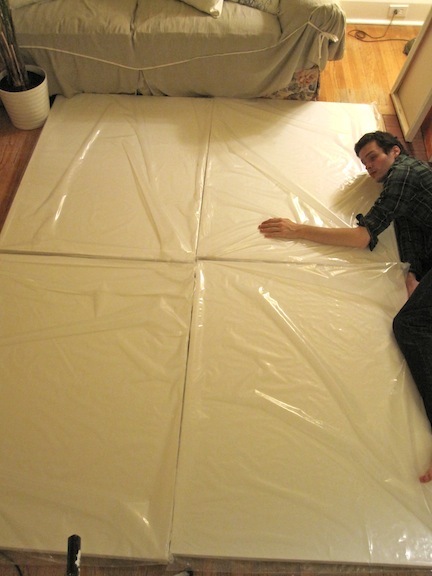 Barbara, that is soooooo exciting to see those canvasses. I can't wait to see the progress you make. It will look delicious! And thanks for the squirrel video. Sooooo cute, but so bad too!! ha ha. No pressure eh? As the guy in the store when I was buying them said, because I was deliberating about the size. No pressure he said, but it was closing time. That makes me think of the Leonard Cohen song, but I hefted those big canvasses out of there with my son as fast as I could move. Okay, I'll show you what I'm up to as I progress. It's funny how everything is relative, and even more so with scale. The canvasses you can see are big, because Sam is incredibly tall, but in the case of the squirrel, the pumpkins are very, very small. Not much bigger than the bottom photo. Maybe five inches across. Or should I say they were, because all that is left of the five pumpkins is some teeny pieces of pumpkin like confetti all over our front steps. Have a great weekend in your studio too. I am pretty excited about this finally being possible. You have to paint what you desire to paint whenever you have the chance. In my case I painted a few food things, and my gallery owner loved them. So it's like baking a pie, people want more. Okay. Meanwhile portraits and other projects continue apace. Miss you. You're making me miss the bad brown squirrel in Nova Scotia who fills our outhouse with pinecone chips. When I'm there I talk to her every day. 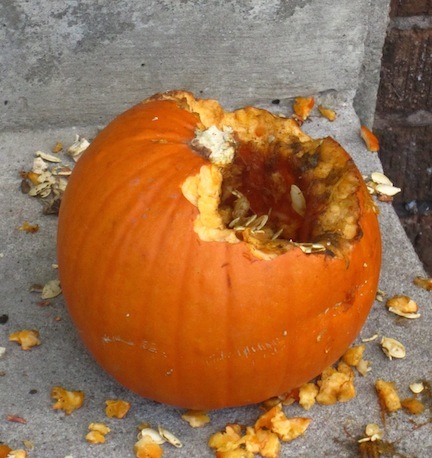 But every squirrel in our neighbourhood, black, grey and multi, has eaten our pumpkins. They are all gone.